Taoiseach Enda Kenny received global recognition for his speech about Irish immigration last night in Washington. The Taoiseach used the St Patrick's day visit to speak about the contribution of the Irish community in the United States, leading to the New York Times calling it a “lecture” for the US President on immigration. The US President told the 'Shamrock Ceremony' that Irish Americans "played a vital role in protecting our union in the hour of its greatest need". He said they had earned the nickname of the 'fighting Irish'. Taoiseach Enda Kenny told Mr Trump that he holds the “future of America, and indeed the world, in your hands”. 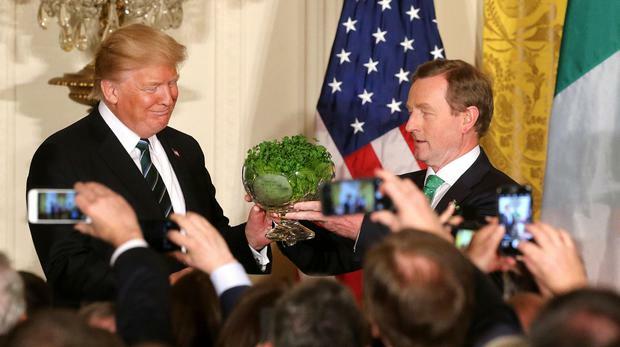 After handing over the traditional bowl of shamrock, he said the US President was taking up a job that “is exceptionally demanding and difficult”. Speaking at a party in East Room of the White House, he thanked Mr Trump for “giving so much of his time” to help celebrate St Patrick’s legacy as “the patron of immigrants”. He appealed to the President to take a more favourable view of immigrants - but made no mention of Mr Trump’s controversial travel ban on six predominantly Muslim countries. “Ireland came to America, because deprived of liberty, opportunity, safety and even food itself, we believed. “Four decades before Lady Liberty lifted her lamp we were the wretched refuse on the teeming shore,” Mr Kenny said. “We believed in the shelter of America, in the compassion of America, in the opportunity of America. We came and became Americans. Mr Kenny said Irish immigrants built bridges and roads, protected the public as firefighters and police officers and cared for the sick in hospitals. “They have entertained as poets, singers and writers. They became politicians, judges and legislators. “And as entrepreneurs they have provided hundreds of thousands of jobs for Americans including, most recently, in exciting technology companies,” Mr Kenny said. “We treasure the Irish-American relationship. Mr President, I wish you, the First Lady Melania and your lovely family every good wish and blessing on this special day,” he said.